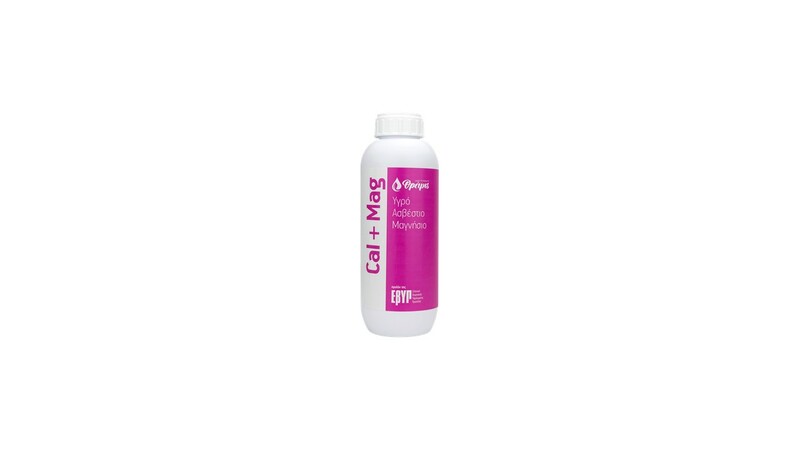 Cal+Mag is a liquid calcium-magnesium chelated fertiliser with selected amino acids, suitable for all crops. Its bioactive components assist in the absorption of Calcium and Magnesium by leaves and improve their transition into plants. Calcium increases the post-harvest durability of fruits and prevents defects such as “dry top” in tomatoes, peppers and vegetables and “bitter pit” in apples. It is recommended for the fast treatment of Calcium deficiencies, using foliar applications. General dosage: Fertigation using 1-2 It / 1,000 m2 or foliar applications using 200-400 ml / 100 It water. Cherries: Application at the start of colour change using 200-300 ml / 100 It water to prevent tearing. Apples: 1st application at the stage of young fruit using 150-200 ml / 100 It water and repeated applications using 200-300 ml / 100 It water to prevent “bitter pit”. Vegetables (Tomatoes, Peppers, Aubergines, Cucumbers): Repeated applications using 200-400 ml / 100 It water to prevent “end-rot”. 1st application after fruit setting of the first cross. 1-2 It / 1000 m2 for applications through the irrigation system. The minimum dosages are applied in greenhouses. Watermelon, Melon: 1st application at the stage of young fruit, using 200-400 ml / 100 It water and repeats after every fruit setting. Through the irrigation system, 2-3 It / 1000 m2 in the same growing stages.